Of all the rooms in the house, our laundry room sees the most action. Our laundry room is always out of sight and out of mind although we spend more time within our laundry room. We produce you some essential tips for small laundry room as well as laundry room interior design ideas. If your laundry room is not large enough, then try to install a workspace countertop over a pair of side-by-side, front-loading machines to have a place to fold, sort or iron clothes. To organize the stuff in your laundry room, try to add cabinets or shelving above the appliances. If you are looking for a place to hang your clothes to dry or to hang them as you remove them from the dryer before putting them away, then using a closet rod, suspended from the cabinet is the solution. Carts on wheels with divided bags are practical and will provide you more space. Just because you have a small laundry room, doesn’t mean you can’t find the desired comfort. By using wall-mounted ironing boards that fold down when needed, you can iron your clothes easily and when you are done, you can fold up your wall-mounted ironing board. To store your shoes and coats neatly, you need to use a bench seat and coat rack. To store all of your household supplies including detergents, cleaning supplies and pet supplies freely, then you should include enough cabinetry – including drawers to your laundry room. If you want to give up taking your clothing to another room, then you should grant yourself sufficient countertop space to enable folding of large loads of laundry. To create an easy-to-use washing station for dirty pets and dirty feet, try to find space for installing a simple shower base with tile walls and a hand sprayer. 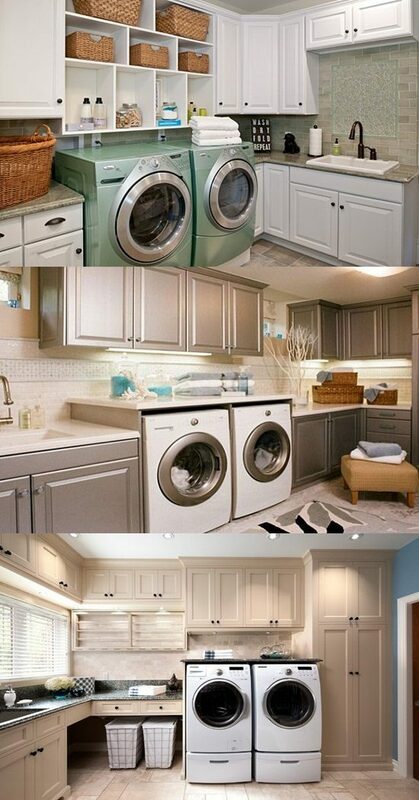 You can get inspiration from the following portrays about wonderful small laundry room tips.